Selection for grain yield under drought is an efficient criterion for improving the drought tolerance of rice. Recently, some drought-tolerant rice varieties have been developed using this selection criterion and successfully released for cultivation in drought-prone target environments. The process can be made more efficient and rapid through marker-assisted breeding, a well-known fast-track approach in crop improvement. QTLs have been identified for grain yield under drought with large effects against drought-susceptible varieties. Most of the identified QTLs show large QTL × environment or QTL × genetic background interactions. The development of mapping populations in the background of popular high-yielding varieties, screening across environments, including the target environments, and the identification of QTLs with a consistent effect across environments can be a suitable alternative marker-assisted breeding strategy. An IR74371-46-1-1 × Sabitri backcross inbred line population was screened for reproductive-stage drought stress at the International Rice Research Institute, Philippines, and Regional Agricultural Research Station, Nepalgunj, Nepal, in the dry and wet seasons of 2011, respectively. A bulk segregant analysis approach was used to identify markers associated with high grain yield under drought. A QTL, qDTY12.1, significantly associated with grain yield under reproductive-stage drought stress was identified on chromosome 12 with a consistent effect in two environments: IRRI, Philippines, and RARS, Nepalgunj, Nepal. This QTL explained phenotypic variance of 23.8% and contributed an additive effect of 45.3% for grain yield under drought. The positive QTL allele for qDTY12.1 was contributed by tolerant parent IR74371-46-1-1. In this study, qDTY12.1 showed a consistent effect across environments for high grain yield under lowland reproductive-stage drought stress in the background of popular high-yielding but drought-susceptible recipient variety Sabitri. qDTY12.1 was also reported previously [Crop Sci 47:507–516, 2007] to increase grain yield under upland reproductive-stage drought stress situations. qDTY12.1 is the only QTL reported so far in rice to have shown a large effect against multiple recipient genetic backgrounds as well as under highly diverse upland and lowland rice ecosystems. qDTY12.1 can be successfully introgressed to improve grain yield under drought of popular high-yielding but drought-susceptible lowland as well as upland adapted varieties following marker-assisted breeding. Drought is one of the most important abiotic stresses hampering rice productivity in rainfed areas. In Asia more than 23 million ha of rice-growing area are rainfed . Eastern India and adjoining areas of Nepal occupy a large drought-affected area with an estimate of around 17 million ha . The green revolution had little impact in rainfed ecosystems . Farmers in these areas are growing popular varieties originally bred for irrigated ecosystems . The slow progress in developing rice varieties for drought-prone areas is mainly due to the complex nature of drought-tolerance mechanisms; large genotype × environment, QTL × environment and QTL × recipient genetic background interactions; and the absence of QTLs with a large and consistent effect against high-yielding but drought-susceptible varieties. Not only the interactions but also the complex nature of drought, which affects the rice plant at all stages of crop growth, and its relation with a number of physiological mechanisms and biochemical pathways further complicate the problem. Therefore, a strategy of screening in different environments, particularly in the target population of environments (TPE), is advocated for developing varieties with broader adaptation . Trait selection is another important concern in drought-tolerance rice breeding programs. Recent studies have reported grain yield (GY) under drought as an effective selection criterion for the development of drought-tolerant rice varieties [6, 7]. During the last few years, several varieties have been developed and released in India, Nepal and Bangladesh following GY under reproductive-stage drought stress (RS) as a selection criterion . The ultimate aim of a plant breeder is to identify rice genotypes with a stable performance across a range of environments, which is a time-consuming process. A marker-assisted breeding (MAB) strategy, advocated to be a fast-track approach in rice improvement for drought-prone environments, can be a suitable alternative strategy as a solution [4, 9]. The marker-assisted backcrossing (MABC) approach has been used to improve the drought tolerance of high-yielding, popular, farmer-adapted varieties grown on a large scale . Several major quantitative trait loci (QTLs) have been identified for high GY under RS [4, 9, 11]. A large-effect QTL, qDTY12.1, was identified for GY under RS in upland situations in a Vandana/Way Rarem population explaining 51% of the genetic variance . Two other QTLs, qDTY1.1 and qDTY3.1, were identified for lowland RS. qDTY1.1 showed a consistent effect in three different genetic backgrounds, Swarna, IR64 and MTU1010, explaining phenotypic variance up to 16.9% . qDTY3.1, identified in an Apo/Swarna population, explained 31% of the genetic variance in lowland RS . QTLs with large and consistent effects are worthy for use in marker-assisted selection (MAS) to improve the drought tolerance of presently cultivated varieties . The most suitable QTL for drought would be one that can overcome QTL × genetic background, QTL × environment and QTL × ecosystem effects. To identify genomic regions with a consistent effect across environments, large mapping populations need to be screened in different environments. Genotyping and phenotyping of large mapping populations involve high cost and much effort. The genotyping cost can be reduced through using a bulk segregant analysis (BSA) approach. BSA has been suggested as a cost-effective and powerful genotyping method in the identification of QTLs for high GY under RS [4, 11, 13]. BSA involves pooling of DNA of the phenotypic extremes and genotyping along with the parents to identify markers linked with the trait of interest . The identification and introgression of QTLs in the background of elite rice varieties could be helpful in MAB . Sabitri is a popular variety of the lowland rice ecosystems of Nepal and adjoining parts of India but it is highly susceptible to drought. Our study was undertaken with the objective to identify QTLs with a large and consistent effect for GY under RS in the background of popular recipient rice variety Sabitri. The study was conducted at the International Rice Research Institute (IRRI), Los Baños, Laguna, Philippines, and at the Regional Agricultural Research Station (RARS), Nepalgunj, Nepal, in DS2011 (dry season, January-May) and WS2011 (wet season, June-November), respectively. The dry-season experiment was sown on December 17, 2011, and the wet-season experiment was seeded on July 22, 2011. A BC1F3:5 backcross inbred line (BIL) population developed from the cross of ‘IR74371-46-1-1’ and ‘Sabitri’ was used for this study. IR74371-46-1-1 is a drought-tolerant variety released in Nepal as ‘Sookha Dhan-1’ . IR74371-46-1-1 is a backcross-derived line from Way Rarem (Way Rarem/2*IR55419-04). Way Rarem is an upland adapted variety of Indonesia. Way Rarem is known to contribute a large-effect QTL for high grain yield under drought . In contrast to IR74371-46-1-1, Sabitri is highly susceptible to drought. The BIL population used in the study was developed by crossing IR74371-46-1-1 with Sabitri twice and BC1F1 seeds were selfed. One BC1F3 seed from each BC1F2 plant was selected and bulked to make BC1F3 seeds. BC1F3 seeds were grown and each plant was harvested individually. The BC1F3:4 plants were grown and harvested in bulk. The BC1F3:5 lines were screened for GY under RS at IRRI in DS2011 and in Nepalgunj, Nepal, in WS2011. where HI is harvest index, GY is grain yield and BIO is total biomass. Harvesting for GY (g m-2 converted to kg ha-1) was done at physiological maturity. Samples were harvested and dried to 12% moisture before weighing . Leaves were collected from each plot from the first replicate of the stress experiment in the DS2011 experiment at IRRI. One leaf from an alternate plant of each plot was taken and bulked so that the bulk represented one BC1F3:5 line. Samples were freeze-dried, cut and placed in eppendorf tubes and ground using a GENO grinder. DNA extraction was carried out by the modified CTAB method and DNA was stored in the deep-well plates (Axygen Scientific, California, USA) . Quantification of the DNA samples was carried out on 0.8% agarose gel. Concentration of the DNA samples was adjusted to ~25 ng μL-1. A reaction mixture of 15 μL including 50 ng DNA, 1X PCR buffer, 100 μM dNTPs, 250 μM primers and 1 unit Taq polymerase enzyme was used for PCR amplification. PCR products were resolved on 8% non-denaturing polyacrylamide gels using a mini-vertical electrophoresis system (CBS Scientific, model MGV-202-33) . A parental polymorphism survey was carried out between IR74371-46-1-1 and Sabitri with 682 rice simple sequence repeat (SSR) markers (ResGen, Invitrogen Corporation, Huntsville) from already available rice genetic and sequence maps [17–19]. BSA was carried out to identify the QTL for GY under RS using 10% of the tail lines. DNA of 5% of the lines with the highest GY and 5% with the lowest GY under RS was extracted and pooled separately to make two bulks: bulk high and bulk low . The concentration of all DNA samples was equalized before pooling. 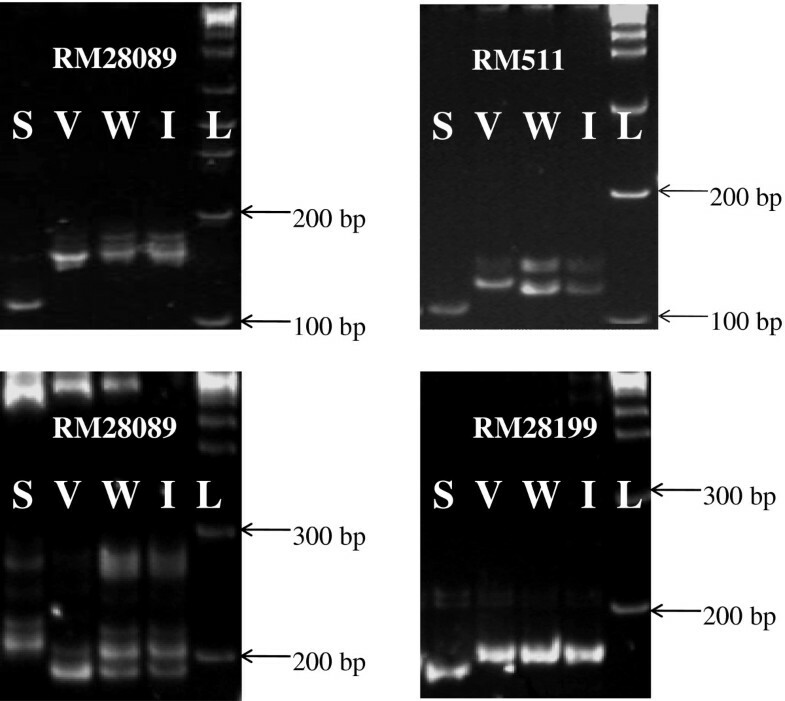 Four DNA samples, including two bulks (bulk high and bulk low) and two parents (IR74371-46-1-1 and Sabitri), were genotyped with 106 polymorphic SSR markers . The significant marker identified in BSA, RM28166, was run on the whole population and single-marker analysis was done. Thereafter, five additional markers (RM28048, RM28089, RM28099, RM511 and RM28199) were run on a whole population to determine the confidence interval of the QTL region. A similar procedure was followed by earlier workers in identifying large-effect drought GY QTLs via BSA [4, 13, 20]. where Vg is genotypic variance, Ve is error variance and r is the number of replications. where AE is the additive effect and AE% is additive effect as a percentage of the population means designated as PM. One million bases on a rice chromosome were assumed to be equivalent to approximately 3.92 cM while determining the genetic distances . qDTY12.1 identified in this study in the IR74371-46-1-1 × Sabitri population was previously identified in a Vandana × Way Rarem population . To better understand the allele contribution for qDTY12.1, an allele survey was carried out using qDTY12.1 markers RM28089, RM511, RM28166 and RM28199 among four parents, Vandana, Way Rarem, Sabitri and IR74371-46-1-1. In DS2011, during the flowering period, the water table was below −80 KPa except for one day when it reached −60 KPa (Additional file 2) because of the three rainy days, March 4–6 (rainfall of 9.6 mm). In WS2011, there was no rain during the stress period and the water table depth was around −100 cm throughout the flowering period (Additional file 3). Phenotypic variations in genotypes were observed for all the traits recorded under RS and NS experiments. Trial means, range and broad-sense heritability of the traits measured in RS and NS carried out at IRRI, Philippines (DS2011RS), as well as RARS, Nepal (WS2011RS and WS2011NS), are presented in Table 1. The NS experiment was carried out in Nepal in the wet season (WS2011) and no NS experiment was carried out at IRRI in the dry season. GY under RS ranged from 0 to 4320 kg ha-1 with a mean GY of 707 kg ha-1 in DS2011 and 885 kg ha-1 in the WS2011 stress trial, whereas mean GY under NS conditions was 4639 kg ha-1, with a range from 1500 to 7500 kg ha-1. Heritability of GY was 0.81 and 0.71 for RS in DS2011 and WS2011, respectively, and 0.86 for NS in WS2011 (Table 1). DTF of the population lines ranged from 76 to 112 days, with a mean of 95 and 88 days in DS2011 and WS2011 RS experiments. Under NS, DTF ranged from 78 to 95 days, with a mean of 87 days. Heritability of DTF ranged from 0.91 to 0.97. PHT ranged from 53 to 118 cm, with a trial mean of 78 and 94 cm in DS2011 and WS2011 Rs experiments. Under NS conditions, PHT ranged from 68 to 138 cm, with a trial mean of 111 cm. Heritability of PHT ranged from 0.67 to 0.72. LR, BIO, HI and PAN were recorded in RS and NS experiments of WS2011 only. LR ranged from 1 to 7, with a trial mean score of approx. 5. Heritability of LR was 0.89. BIO ranged from 1200 to 9048 kg ha-1, with a trial mean of 3882 kg ha-1 under RS, whereas, under NS, it was 4500–21380, with a trial mean of 12090 kg ha-1. The heritability estimates for BIO under RS and NS experiments were 0.77 and 0.84, respectively. HI ranged from 0.01 to 0.62, with a trial mean of 0.20 under RS, whereas, under NS, the range was 0.20-0.70, with a trial mean of 0.30. Heritability for HI under RS and NS was 0.47 and 0.79, respectively (Table 1). DS2011RS: RS experiment of dry season at IRRI; WS2011RS: RS experiment of wet season in Nepal; WS2011NS: NS experiment of wet season in Nepal; GY: Grain yield; DTF: Days to 50% flowering; PHT: Plant height; LR: Leaf rolling; BIO: Biomass; HI: Harvest index; PAN: Panicle number; NF: Did not flower; LR, BIO, HI and PAN were measured in WS2011RS only. Phenotypic correlations between GY and other traits were calculated and are presented in Table 2. GY was negatively correlated with DTF in DS2011 and WS2011 RS experiments. This correlation was positive in the NS experiment. A positive but significant correlation was observed between GY and PHT in the NS experiment; however, it was non-significant in RS experiments. A strong positive correlation was observed between GY and BIO and HI in RS experiments. WS2011RS: RS experiment of wet season in Nepal; WS2011NS: NS experiment of wet season in Nepal; DS2011RS: RS experiment of dry season at IRRI; GY: Grain yield; DTF: Days to 50% flowering; PHT: Plant height; LR: leaf rolling; BIO: Biomass; HI: Harvest index. *: Significant at P ≤ 0.05. NR: LR was not recorded in NS. QTLs for GY, DTF, PHT, LR, BIO, HI and PAN were identified under RS but none of them were significant in NS situations. A QTL (qDTY12.1) on chromosome 12 was identified for GY under RS flanked by markers RM28099 and RM28199 showing a consistent effect in two seasons, DS2011 and WS2011 (Figure 1). At IRRI in DS2011, qDTY12.1 explained a phenotypic variance of 3.8% but contributed an additive effect of 22.5% of the trial mean yield, whereas, in WS2011 in Nepal, qDTY12.1 explained a phenotypic variance of 38.8% and showed an additive effect of 69.5% of the trial mean yield. In combined analysis over two seasons, this QTL explained a phenotypic variance of 23.8% and additive effect of 45.3% (Table 3). This QTL was significantly associated with PHT in DS2011, and with DTF, LR, BIO, HI and PAN in WS2011 RS experiments. Phenotypic variance explained by this QTL for PHT in DS2011 was 1.1%, contributing an additive effect of 6.3%. Phenotypic variances for DTF, LR, BIO, HI and PAN were 6.5%, 38.6%, 18.0%, 27.4% and 36.0%, respectively. Additive effects contributed by this QTL for DTF, LR, BIO, HI and PAN were 1.5%, -32.6%, 20.9%, 47.1% and 22.3%, respectively. Two other QTLs, one each on chromosomes 2 and 3 (qDTY2.3 and qDTY3.2), were also found significant for GY under RS in DS2011. qDTY2.3 explained a phenotypic variance of 6.5% and an additive effect of -19.7%. qDTY3.2 showed phenotypic variance of 7.5% and an additive effect of 20.9% (Table 3). F-statistics for QTL analysis of grain yield under drought stress in the IR74371-46-1-1 × Sabitri population of rice. AE%: Additive effect as a percentage of population mean; BIO: Biomass; CI: Confidence interval of the QTL (physical distance in Mb); DTF: Days to 50% flowering; GY: Grain yield; HI: Harvest index; LOD: Logarithm of odds; PAN: Panicle number; PHT: Plant height; LR: leaf rolling; R 2 : Phenotypic variance. qDTY12.1 has been identified as a QTL showing an effect under direct-seeded upland conditions  in a Vandana/Way Rarem population. Figure 2 presents the results of an allele survey conducted at qDTY12.1 locus. It was observed that Way Rarem and IR74371-46-1-1 alleles at RM28089, RM511, RM28166 and RM28199 (markers within the qDTY12.1 region) were the same. Allelic pattern of markers RM28089, RM28089, RM511 and RM28199 of qDTY12.1 in Vandana (V), Way Rarem (W), IR74371-46-1-1 (I) and Sabitri (S). L = 1 Kb Ladder. Developing rice varieties with high GY under RS is necessary for obtaining sustainable rice yields in drought-prone areas. Popular farmer-accepted varieties could be improved for high GY under RS by following fast-track MAB approaches. Studies have been conducted at IRRI in the past in which large populations developed from crosses between drought-tolerant donors and high-yielding drought-susceptible varieties were used to identify QTLs with a large effect on grain yield under drought [4, 9, 11, 13]. However, large QTL × environment interactions have been reported [23, 24] and therefore it is necessary that a QTL for GY under RS show a consistent effect across a wide range of environments for its successful use in MAS. The identification of a drought GY QTL showing a low QTL × environment interaction effect would be quite useful for MAB purposes. For this, a mapping population needs to be screened at multiple locations. In this study, a population was screened at two locations, IRRI, Philippines, and RARS, Nepal. Dry-season screens at IRRI have been earlier reported to be comparable with wet-season screens in the Indo-Gangetic plains . Phenotypic screening at IRRI, Philippines, and RARS, Nepal, is also comparable as can be seen in this study (Table 1). Previous studies have used this correlation by identifying QTLs through large-scale screening in the dry season at IRRI and validating their effect in the target environment through multi-location testing of a small sub-set of the original mapping population . In this study, we streamlined the QTL identification protocol by combining phenotyping in a target environment (TE) and an effort-saving genotyping method, BSA, for the identification of consistent large-effect QTLs. Recently, qDTY1.1 has been reported to show a large effect against three recipient backgrounds . Earlier, a CT9993-5-10-1-M/IR62266-42-6-2 population was screened at multi-locations and different QTLs were reported to show tolerance by different authors. In a study conducted by Babu et al. , QTL gys1.1 affecting grain yield under stress was reported between EM18_10 and L1087 at 113.2-122.2 cM (http://www.gramene.org) on chromosome 1. However, in a study conducted by Kumar et al. 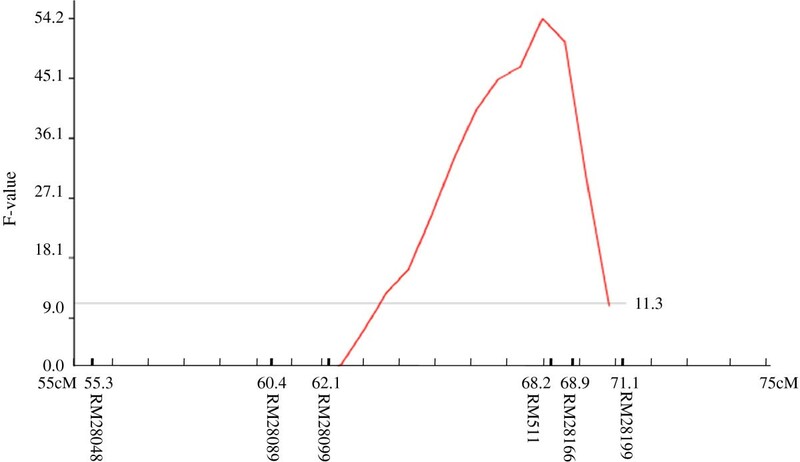 , the QTL on chromosome 1 was reported between EM11_11 and RG109 with a peak position at 206.6 cM. Babu et al. also reported a QTL (gys4.1) affecting GY under stress on chromosome 4 between RG939 and RG476 at 103.6-111.7 cM (http://www.gramene.org), which was not reported in the study by Kumar et al. . Despite using the same population, both these studies reported different regions contributing to grain yield under drought. Very few reports of a wide range of consistency exist to date for QTLs for GY under drought. Apart from this report, qDTY1.1 reported by Vikram et al. and Ghimire et al. has shown a wide range of effects across donor and recipient backgrounds. However, qDTY1.1 also showed an effect only under recipient varieties of the lowland ecosystem. For a QTL to be widely adopted in a MAS/MAB program, it is necessary that it show a large and consistent effect in different environments, against the genetic background of different recipient drought-susceptible varieties and across ecosystems, upland and lowland. However, in the literature, no such QTL has been reported so far. qDTY12.1 has been reported previously in a population derived from the cross of upland cultivars Vandana and Way Rarem, in which it explained a genetic variance of 51% for GY under upland RS . Bernier et al. failed to see any effect of qDTY12.1 in lowland RS. Swamy et al. reported the presence of the positive qDTY12.1 allele in 85% of the lines from a panel of random drought-tolerant lines. In this study, high heritability for GY under RS indicates uniformity of drought phenotyping and high stability of the identified QTL. The strong positive correlation of GY with BIO and HI indicates that continued maintenance of biomass production and fertile grain production are the two most important attributes of increased GY under drought. This study identified a large effect of qDTY12.1 under lowland RS vis-à-vis upland RS reported earlier by Bernier et al. in a Vandana × Way Rarem population . In this study, qDTY12.1 is found to be located on chromosome 12 flanked by markers RM28089 and RM28199 (Figure 1), whereas the QTL interval in an earlier study in a Vandana × Way Rarem population was RM28048 to RM511. The consensus region between the two studies was RM28099-RM511 (Figure 3). This interval could be very important for further genomic studies related to qDTY12.1. qDTY12.1 showed an additive effect of 45.3% with a phenotypic variance of 23.8% over two years for GY under severe RS conditions (Table 3). It is also important that this QTL has shown a similar high magnitude of effect across the backgrounds of upland-adapted variety Vandana, for which it explained 33% of the phenotypic variance under severe upland drought, and lowland-adapted variety Sabitri, for which it explained 23.8% of the phenotypic variance under severe lowland drought and across environments at IRRI, India , and IRRI, Nepal, as found in this study. From this study as well as from an earlier reported study of Bernier et al. , it is established beyond doubt that qDTY12.1 shows an effect against different recipient genetic backgrounds – upland-adapted Vandana and lowland-adapted Sabitri, different environments – IRRI, India and Nepal, and different ecosystems – upland and lowland. However, phenotypic variance explained by qDTY12.1 for GY under RS varied between the DS2011RS experiment at IRRI, Philippines (3.8%), and the WS2011RS experiment at RARS, Nepal (38.8%). This difference could be attributed to QTL × environment and QTL × season interaction effects or higher severity of drought at IRRI than in Nepal. Although there was a difference in phenotypic variance, qDTY12.1 showed a consistent and significant effect at both locations. It is evident that the qDTY1 2.1 locus is of high importance for MAS, and its pyramiding with other QTLs could have a strong advantage for grain yield under drought. Comparison of the confidence interval of QTLs in a Vandana × Way Rarem population reported by Bernier et al. (2007) and the IR74371-46-1-1 × Sabitri population investigated in this study. In contrast to the similar magnitude of effect of this locus seen under lowland RS conditions in this study vis-à-vis the upland ecosystem in an earlier study , it is interesting to see that the alleles at RM28166 (the peak marker in this study) are the same for Way Rarem (the donor in the previous study) and IR74371-46-1-1 (the donor in this study). This is obvious because Way Rarem was one of the parents used to develop IR74371-46-1-1. 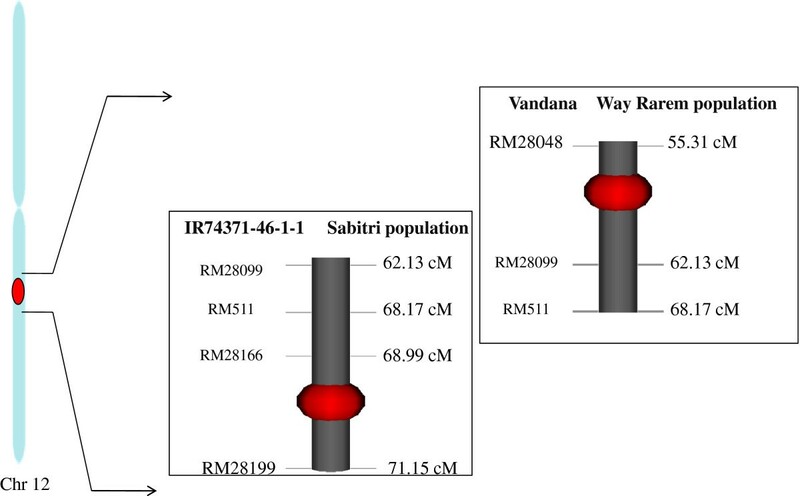 It was also reported recently that the Way Rarem allele at the qDTY12.1 locus showed a significant interaction with qDTY2.3 (RM573) and qDTY3.2 (RM523) regions contributed by the tolerant recipient Vandana . This interaction resulted in a significant effect on GY under lowland RS conditions in a Vandana/Way Rarem population. In this study, QTLs for grain yield under drought were observed in the qDTY2.3 and qDTY3.2 regions although no interaction was observed. This study confirmed the effect of qDTY12.1 under lowland conditions, which has not been seen before in a Vandana/Way Rarem population. Vandana is a drought-tolerant upland-adapted cultivar and it possesses qDTY2.3 and qDTY3.2 for grain yield under drought. The appearance of lower drought stress severity under lowland conditions as compared to the severe drought in upland conditions and the tolerance provided to Vandana by qDTY2.3 and qDTY3.2 in lowland may be the reason for not observing the effect of qDTY12.1 contributed by Way Rarem in lowland drought earlier in a Vandana/Way Rarem population. On the other hand, Sabitri is a highly drought-susceptible lowland-adapted cultivar, allowing the effect of the qDTY12.1 allele contributed by IR74371-46-1-1 to be seen in lowland even under drought severity lower than that observed in upland. This becomes even more relevant when we see that qDTY12.1 as well as qDTY2.3 are contributed by IR74371-46-1-1 in this study. Recently, candidate gene analysis has been carried out in this QTL region and several genes have been reported as putative candidate genes, including a GRAM-domain-containing protein, an Amydohydrolase, a Nodulin MtN3, a No Apical Meristem, a Cellulose Synthase A (CesA10) and a cytochrome P450 associated with different processes such as root hair proliferation/elongation, pollen fertility, cell wall permeability and signal transduction [31, 32]. Swamy et al. carried out meta-QTL analysis and reported several candidate genes in the same region. qDTY12.1 could be efficiently used in marker-assisted breeding for the improvement of both lowland and upland rice varieties for drought stress. A major drought grain yield QTL on chromosome 12, qDTY12.1, was identified showing a high and consistent effect across two environments – IRRI, Philippines, and RARS, Nepal. The positive allele for qDTY12.1 was contributed by the tolerant parent IR74371-46-1-1. Based on a previous study conducted under the upland drought ecosystem in a Vandana/Way Rarem population and this study under the lowland drought ecosystem in an IR74371-46-1-1/Sabitri population, it could be concluded that qDTY12.1, qDTY2.3 and qDTY3.2 are important regions for improving grain yield under drought of susceptible varieties of both lowland and upland ecosystems following MAB. The authors are grateful to the Bill & Melinda Gates Foundation (BMGF) for providing financial support for this study. The authors acknowledge Marilyn Del Valle and Joanah Ruth Ramirez for their technical support in the completion of this study. Authors declare that there were no competing interests. KKM was involved in the analysis, interpretation of the data and drafting the; PV was associated with the analysis and interpretation of the data and the revision of the manuscript; RBY was involved in the conception of the experiment and drafting the article; BPMS, SD, MTSC, PM and SM helped in the analysis and interpretation of the data and revised the manuscript; AK was involved in the conception and design of the experiment and the critical revision of the manuscript. All authors approved the final version of the manuscript.